Hours: 10am - 3pm, Mon-Fri, during regular school days. Admission: No admission fee, but donations are appreciated. JGarden Description: The garden on this site provides a gateway to the NBI Cultural and Resouce Center. The design was a collaborative one that has included the EvCC, the NBI staff, Zen Landscape and Design and Japanese Architects and Builders. Over $350,000 has been raised and pledged through private donations, grants, and other gifts for the design, construction, and maintenance of the garden. The project is managed through the NBI and evcc Foundation, with valuable assistance from the NBI garden advisory committee. Zen Landscape & Design and Sukiya Home Inc. will construct the major garden features, including a water feature and garden gate and wall. The project was opened in June 2004. 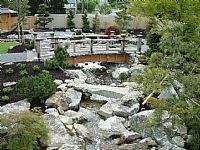 Since 1987 the Nippon Business Institute Japanese Cultural and Resource Center has been a program department of Everett Community College in Everett, Washington. The primary mission of the NBI is to help "Bridge the Cultural Gap" which exists between eastern and western cultures. With our mission in mind, we promote the study of language, history, culture, social structure, economic issues, communication styles, and business protocols. We also facilitate a wide array of interactions between local businesses and Japanese companies, as well as between members of our community and their Japanese friends and associates. The NBI Japanese Cultural and Resource Center is a new facility, providing a home, from which we are able to conduct our programs. Initial funding for the center was provided by the Commemorative Association for the Japan World Exposition (1970)along with many generous private individuals, groups, organizations and companies. Designed by architect Kazuyuki Murata, the Center's construction has occurred in two phases. Phase I construction was completed in May 1997; Phase II was completed in October 1999. The NBI Japanese Cultural Center's amenities include: administrative offices, student computer labs which house computers capable of both Japanese and English language functions, meeting space, a demonstration kitchen, a small library of Japanese books that can be checked out, a Japanese tatami room for tea ceremony instruction, and classrooms. The garden has been the third and final phase of the project.